We are looking for tips or advice on what to do with our stuff (towels, shoes, other personal belongings) while we are out in the water snorkeling. We are going to Bermuda and will be renting a Twizy. We understand that there is really no place to lock your stuff in the Twizy. Comments for What to Do with Towels, Shoes, Etc. While Snorkeling? Hi Thompsonbrook, thanks for your question. While we recommend belting a waterproof box to you while you snorkel for your valuables (ID, money, credit cards, cell phone, keys, etc. ), we normally leave our shoes, towels, inexpensive sunglasses, hats, snorkel bags, sunscreen, etc. on the beach well above the water line. Of course, we don't leave our shoes if we need them for entering and exiting the water. We have never had anything disappear doing this. It will be interesting to hear if others have any different methods or experiences. We have used a snorkel belt with clips to attach a waterproof case for valuables such as car keys, etc. However the case leaked because we over filled it, our mistake. On our last trip, we brought a portable lock-box with a detachable cable on Amazon which worked great. We left passports at our airbnb, but used the lock-box for keys and money. We attached the lock-box to our guild cart, our chaise lounge, or to the railing in our deck. No problem. We left towels, cover ups and shoes on the dock, with absolutely no problem. Thanks, Nicole & Galen. I read through the link you included in your post. Lots of great advice in there. Pam, thanks also for your comments and advice. You might have been saved if you had everything in your waterproof box in another waterproof bag, even a ziploc, inside. We always do this. It also helps with making sure you are not over-stuffing it. We mention this on the waterproof box page above under "Keep Your Stuff Dry." My "system" is mainly for doing drift snorkels where it's a one-way trip with all my stuff. However, I also use it for shore snorkels where there might be boat traffic or where there just isn't a good place to leave my stuff. First a waterproof drybox for stuff that absolutely has to stay dry. Then I put that in a dry bag along with whatever else I have with me that's no big deal if it gets wet (dry bags can leak in a snorkel situation). Next, if there may be boat traffic I tether the dry bag to my "diver down" float (shoes, sandals, etc. are easily hooked to caribiners on the float). See my picture. 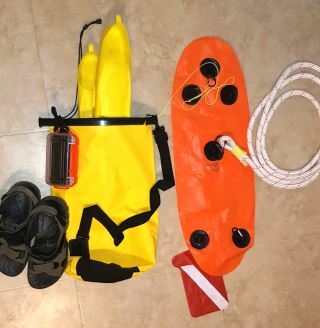 I attach a 3/4" by 12 ft long braided nylon rope to the bottom of the float as a kind of sea anchor so that when I free dive I don't have to worry about the float drifting away with the wind. It's something I copied from a snorkel guide in Roatan (where I'm at now, by the way). We used a Speed Hound Swim Buoy Dry Bag for our many long snorkels in Bonaire and it was fantastic. It was big enough to hold travel towels, glasses, sandals and our clothes. It also acts a safety buoy and greatly improved our visibility - every time we got out someone commented what a good idea it was and asked where we got it. And, it kept everything including my phone and e-reader completed dry. The dry bag attaches around your waist and while I kicked it once in a while it wasn’t annoying - in fact it was helpful because it it was getting ahead of me I knew the current was strong and I should loop back. My husband had his own waterproof pouch for his glasses, inhaler, car keys and phone and it worked really well too. He used the loop on his water shoes to hook them onto the belt as his shoes didn’t fit in his closed foot fins. I am traveling without a companion these days and so purchased an inflatable swim buoy from Amazon that has a "dry bag" compartment for some "stuff". It also came with a triple lock case for my phone and I have a similar one for my travel (small) wallet and keys. I leave the passport locked up where I am staying but if I knew ahead I had to bring it, then I would have a third triple lock case for it. My prescription sunglasses go in a ziploc. I have a backpacker's towel in a sandwich ziploc and carry a small refillable tube of sunscreen since I mostly cover with rash guards and wet suit. I wear neoprene socks under my fins because my feet get cold so I leave my shoes in the car because I can walk in with just the socks on if I need foot protection. I carry eight ounces of water and a protein bar. My buoy has occasionally leaked, because it is quite full. The key is in packing and closing it properly, and keeping it right side up. Also, the extra protection for the water sensitive stuff is critical. The swim buoy sounds like a great idea in concept (visibility, keeping stuff dry) but having these things physically attached will not allow you to dive down unless you have a very long rope attached. Hubby and I enjoy taking long, deep free dives while snorkeling and we couldn't do that with the dry bag buoys. We have enjoyed snorkeling, on many different islands, for over 25 years. Some beach locations seem safer than others, but you always have some fear about leaving valuables on the beach when snorkeling. We solved the problem by purchasing the Pelican brand waterproof containers, which come in multiple sizes. My wife has a larger one as she always has more she want to protect. And for added water security we place some items in ziploc bags before going into the box. Best to find a nylon belt with a mesh bag and draw string that the box can easily fit into. The belt snaps together around your waist, plus the belt can hold a pair of sandals for entering and exiting a rocky location. You can always replace towels, beach chairs, hats, etc., but we always have our car keys, rental home keys, driver license, credit cards, cell phone or anything else worth keeping safe. This solution allows us to both snorkel together without concern for valuables being stolen. Hello Dennis, the Pelican cases are not rated waterproof, simply water tight. From their site, "Case is able to be submerged under 1 meter of water for up to 30 minutes in accordance with IP67 testing parameters". Most folks snorkel longer than that and/or freedive down deeper than three feet. They have a purge vent on the front of them and when we spoke to the Pelican folks at a trade show, they said we would need to silicone up the purge hole to make it waterproof-ish. Do you or your wife freedive down and dunk the Pelican cases fully? We have avoided these cases because of this really only water-resistant rating. I am not a snorkel "free diver", stay mostly on the surface with only an occasional deeper dive to capture a better photograph. I will snorkel from 4-5 times daily for about an hour each time both shallow and deep water. My smaller Pelican 1040 series case has never leaked, but my wife has had a few leaking issues due to not properly attaching the closer on her large Pelican case. And you can add silicone seal around the rubber seal edges if you want. Again for extra water protection, use of small sandwich size ziplocs are great too. Dennis, thanks for taking the time to reply. Good to know about your experience with the Pelican cases. During my continuing visit to Roatan I have noticed that the "sea anchor" (rope) that I attach to the "Diver Below" float needs a little more weight to impede the float's wind-drift during a free-dive. So, I'll add some kind of weight to the end somehow, maybe 1/2 pound or so. Great tip on the Speed Hound Swim Buoy. I'm going to try one. I had never run across them nor heard about them before. Our system is very similar to that of Richard. One adaptation we've made is that, instead of carabiners, we have now switched to attaching an industrial tool lanyard to the dive buoy. It is long and sturdy enough to hold our dry bag and three pairs of water sandals behind the buoy. The whole system may seem cumbersome, but it has served us well. As mentioned, it allows us to leave the water and resume walking wherever we wish, or perhaps need to. We used to leave stuff on the beach, now we don't leave a single thing behind. We have two systems: this one for what we call "dedicated snorkel" outings, and another where we bring the kitchen sink to the beach (chairs, football, book, binoculars, snorkel gear, or whatever) and someone stays with with the gear at all times (usually whoever is feeling bookwormish that day). Great tip on the industrial tool lanyard. Never heard of them... not a tool guy. I'm getting one. Since we purchased a Loctote Flak Sack, we no longer worry about leaving valuables behind on the beach or in a hotel room. It's comfortable enough to use daily as a backpack/purse while holding cameras, passports, wallets, etc. and then locks to something solid like a chair or steering wheel and off you go! We have used one for several years and really enjoy the peace of mind of knowing our valuables are safe. Thanks for the advice on the Loctote, Penny. Looks like that might be a solution for us.